The calendar is always kept current. It is not my intention to waste your time or bait and switch. If your desired dates show as available, they are. It is our goal to make your vacation in Rosemary Beach a fantastic experience. We have been renting our home In Rosemary for over 18 years and we know that communication and attention to detail are what separates the good from the great. You will be delighted with this gorgeous SOUTH of 30-A home located at 89 Hopetown Lane. See map. We are just 5 houses from the Gulf on the preferred south or beach side of 30-A. 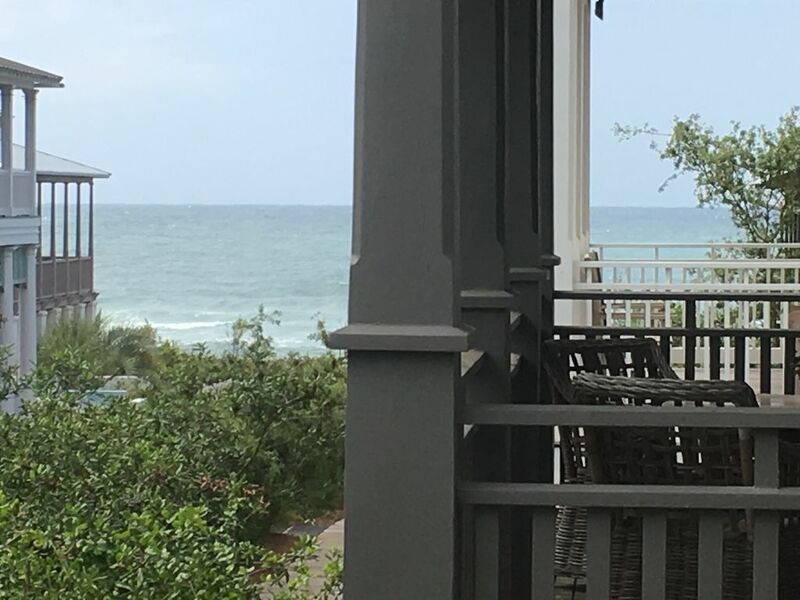 The front of the house faces one of Rosemary's charming pedestrian wooden boardwalks, (walkover F.) Out the front door and in @150 steps, you are at the Gulf. Behind Amsler Cottage is downtown Rosemary and The Pearl, Rosemary's beautiful inn. There is easy access to the shops, the restaurants, and the hustle and bustle of town activity . We are very near the town center, the Western Green and the Beautiful Gulf of Mexico. 4 BEDROOMS/ 5 FULL BATHROOMS plus private outdoor shower with hot water. There is an additional full bathroom on the first floor plus an outdoor shower with hot water for washing off sand. Professionally decorated, the furnishings strike a perfect balance between comfort and elegance. Unique lighting fixtures, luxurious fabrics and elegant furnishings abound with hardwood floors, mahogany French doors and custom finishes throughout. There are 3 fully furnished porches and an enclosed courtyard to enjoy as well. The first floor is open with three sets of mahogany French doors facing the boardwalk. Watch as pedestrians stroll down the boardwalk to the beach while dining, watching TV or reading in front of the gas fireplace. There are 5 flat screen TVs in the house. Movies and tv shows can be streamed through Netflix and there is HBO as well. Slipcovers and sea grass rugs create an upscale yet comfortable atmosphere. The fully equipped gourmet kitchen features granite and tumbled marble finishes, Bosch dishwasher, gas burners, a separate beverage fridge and custom made cabinetry. Seating for 8 at the dining table as well as counter top seating for 2. Also on the first floor is a guestroom with a queen bed for those that prefer not to climb stairs. Crisp linens dress the bed and there is a beautiful full en suite bath.Travertine tiles, a trough sink and a rain head shower make this bathroom a true spa experience. There is an additional interior full bath on the first floor for everyone,( the fifth one), which has a unique connecting indoor-outdoor shower. The laundry is also located on the first floor. The second floor has 3 true bedrooms, all with private en suite baths. No beds/bunks are built into the hallways and all beds are real beds, i.e. no roll away, sofa beds or futons. All beds are supplied with high quality mattresses and linens. The master suite holds a romantic king size bed.French doors lead out onto a porch with Gulf views and comfortable furniture. The large master bath has unique double custom made sinks, travertine floors and a large shower. The bunk room has 4 individual custom built extra long twin beds and an en suite bath with tub and shower. Each bunk has its own light and curtains that can be drawn for privacy. It is ideally suited for kids but we have had many happy adults sleep there as well. The fourth guest room has a beautiful white antique queen bed and mahogany french doors that lead to a large screened- in porch. The porch is equipped with a custom made hanging swing bed for naps and another area to just read and relax. This room also has an en suite bath with tub and shower. Up a spiral staircase to the third floor is an extra space for those occasional rainy days. Featuring a built in daybed, a flat screen tv, and a DVD/VCR, it is a great space for kids to play or a private retreat for an afternoon nap. Books, games and children's movies are provided for your enjoyment. The back courtyard of our cottage is walled and has a big built in natural gas grill, comfortable seating for 10 at a custom made table and a lovely fountain. There is no carriage house on property which is a huge plus. Note: Many of Rosemary Beach homes have a garage/carriage house that is built behind or adjacent to the main one. Unless you rent both structures, parking availability, the size of the outdoor space as well as privacy may be affected. No sharing with strangers here as the outdoor space at this home is yours alone to grill, dine and enjoy. We have included the floor plans in the photo section. Our guests' comfort is our priority and we want to make sure that the layout works for your needs. Overseen by 30A Cottages and Concierge, guests will experience in-house check in and first class service from housekeeping to restaurant and activity reservations. High grade sheets and towels as well as organic bath and toiletries are provided. Most importantly, should you need or want anything, a staff member will be on hand to insure you are taken care of. The rental rates for Amsler Cottage are arrived at by undercutting the prices of the homes around us. Our goal is to provide an excellent value by cutting out high commission rates to a management company while still providing the convenience of a concierge service. There is no add on 'processing fee' , or ‘ amenity fee’. I don’t appreciate being upcharged at the end of the process and assume noone else likes it either! There are 4 beautiful community pools in Rosemary Beach open to owners and guests. Closest to us are the Barbados and Coquina Pools, each @ a 5 minute walk. The current access codes will be provided prior to arrival. Both the tennis and fitness center are available for a fee. (Even homeowners are required to pay for usage of these amenities). There are 2 available spaces on Hopetown Lane. One is in an offstreet arbor and the other is on the lane, both directly behind the house. Getting around Rosemary by walking or by bike is most common. Four adult beach cruisers are included with the house. Baskets and locks provided as well. Additional bikes can be easily rented. A 50% deposit is due at time of booking. Remaining balance is due 60 days prior to arrival. A full refund less $300 is guaranteed if reservation is cancelled outside of 60 days. We are a family of four and we live in Atlanta. We purchased this lot in Rosemary Beach in 1998 so that our two boys would have a place to play in the sugar white sand. Said two boys are now grown but still love playing in the sand. We worked with an architect to design a house that would be both beautiful as well as practical. I am an interior designer and really enjoyed the process of decorating this home. We had rented in Seaside, (too crowded), Sandestin,(too cheesy) and Sea Grove, (not enough going on). We purchased a lot so early, ( 1998), that we were able to buy directly on a boardwalk, very close to the gulf and the town center. We were in the right place at the right time , for once! Taking naps on the swing bed, watching people stroll up and down the boardwalk, enjoying the gulf view off the second story porch, getting ice cream at the very nearby sugar shak. We also employ a local concierge/maintenance service that can provide our guests with anything they might need or want. The benefits of dealing with an actual owner combined with an onsite 24 hour maintenance and housekeeping service is the best of both worlds! This is a very unique arrangement. Four adult beach cruisers with baskets and locks provided. Guests at amsler cottage have access to all 4 of rosemary beaches' beautiful pools. Great location, clean and accommodating house and excellent/responsive owners. Great house in a perfect location. Suited our 2 families (8 total people) well. If you want to be close to the beach and Rosemary Square, it’s the perfect place. House is decorated beautifully and the kitchen is very well appointed. Owners are extremely communicative and helpful as well. This was our first time staying in the town of Rosemary Beach but not the first time on 30A. The Amsler Cottage was a wonderful introduction to the town! This was a last minute spring break trip and luckily this house was available. The house is immaculately kept and very well appointed. The house was large enough to allow our 4 children to "spread out" on their own, but it feels very cozy and warm and has great gathering spaces for family time. The furniture was all very comfortable and the kitchen was well equipped including a separate beverage refrigerator. We can't comment on the responsiveness of the concierge because we literally had zero issues to be addressed. However, given the owner's attentiveness, I'm sure it would have been superb. Susan Amsler (owner) was on top of getting us as much information regarding beach service and also the activities that would be occurring in the town during our stay. That was a very nice touch. The house is deceptively close to the beach access even though it is 5 houses off the beach. We believe that it is actually a shorter walk to the beach than our normal oceanfront condo where we have stayed in the summers. Overall, we can't say a single negative thing about our stay at Amsler Cottage. We would highly recommend and anticipate returning in the future. The house is beautiful and the owners made sure everything was perfect. Close to the beach and town square. Couldn’t beat the location. We will certainly be back to rent this house again. Beautiful Home just steps from the ocean! We had a wonderful time at this house. It was immaculately clean, very spacious, great bathrooms, and only a few steps from the beach!! The location does not get any better. You are also right around the corner from the Pearl and several restaurants and shops. Host was very sweet and responsive with fast communication. Kitchen was well stocked as well as beach chairs/toys. Will hopefully be back! Stay was great. Owners were great. Vrbo fee is absurd. We’ll book this property again but not thru vrbo. There is no booking or processing fee.